Kokage Stout is a 7% stout from Cocono Hops but is contract brewed at Echigo Beer Company for them. It’s brewed using 100% malt, thus without any adjuncts and as such, is styled as a beer rather than a happoshu. At the time of writing, it can be found in bottles though I suspect it may also be on tap somewhere if Echigo Beer Company is behind the brewing part. Kokage Stout poured out a pitch black colour with a thin amount of a slight tan head, which dissipated quickly to an even thinner brown layer on the top. It had a faint aroma of cacao and coffee with also a thick molasses brown sugar aroma to it as well. The aromas didn’t develop much further than that once it had warmed up. Nor did they linger on the nose either. At 7%, Echigo Beer Company did a great job in hiding the booziness of it behind the layers of cacao and coffee. Even when it had warmed up, Kokage Stout lacked any boozy punch behind it. The body had some smooth creaminess to it as well though the body lacked enough carbonation or thickness to really hold it all together. In the end, Kokage Stout ended up being more of watery stout than a bold one with the aftertaste just limping into show with hints of chocolate just about making an appearance. 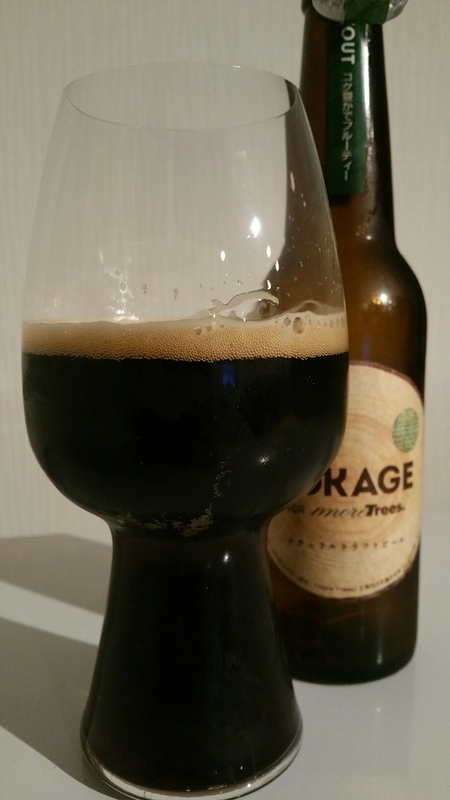 Kokage Stout is a boring stout that’s drinkable but not memorable.